Come learn about the struggle, perseverance, and cultures of Latinos through the arts and educational discussion. 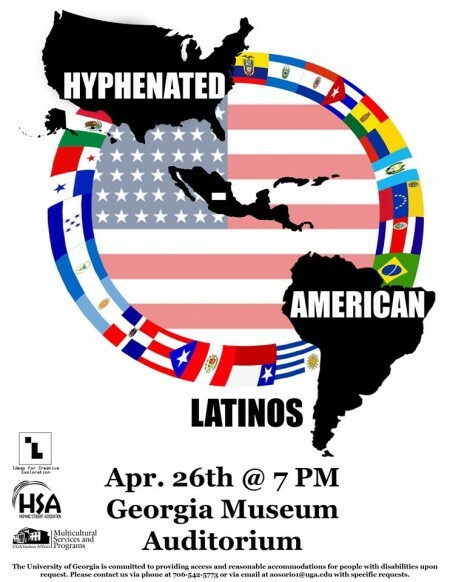 Topics of identity, different immigration statuses, educational injustice in Georgia, and more will all be covered. Art gallery, spoken word, and lots of live music with a reception to follow. Free to the public. Dr. Sergio Quesada, UGA LACSI professor: discussing why it is important for Latinos to maintain their cultural identity. Heidy Guzman, MA in Professional Counseling: discussing some of the psychological impacts of immigrations. Johanna Cochran, Associate Attorney with Kuck Immigration Partners: presenting on Policy 4.1.6 and on the difficult process to gaining legal status in the US. Supported in part by an Idea Lab Mini Grant.